PocketFullOfApps | ‘Virtual City Playground’ Released! G5 Entertainment, the leading publisher of hi-quality, addictive adventure and strategy games for iOS, Android, Mac and PC, have announced that Virtual City Playground is now available on iPhone and iPad. 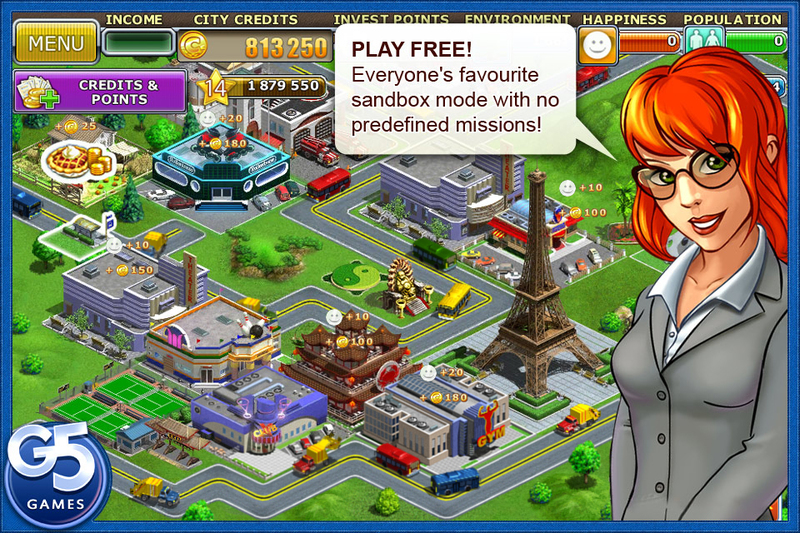 Virtual City Playground is the social free-to-play version of G5’s runaway hit Virtual City. Following the successful launch of Virtual City Playground on the iPad, G5 Entertainment is bringing this unique strategy experience to every iPhone and iPod touch owner. When Virtual City launched one year ago, it became an instant hit on iPhone and iPad. Since then, anticipation has been steadily growing for the next installment in this beloved city-builder game. Calling all Virtual City aficionados! Rejoice and get ready to download Virtual City Playground for FREE starting October 20th! Indulge yourself with unlimited free-play or complete 87 new quests. Experience tons of new content… but prepare yourself! More free content is on its way in upcoming game updates! Extra content in the game includes: 10 exclusive landmarks: Acropolis, Big Ben, Coliseum, Eiffel Tower, Empire State Building, Tower of Pisa, Saint Basil’s Cathedral, Statue of Liberty, Sydney Opera, and the Taj Mahal. 68 unique decorations to help players create the most enviable place in the world. New entertainment buildings to help the city prosper: Restaurant, Club, Fitness Center, Museum of Modern Art, History Museum, Tennis Court, Bowling, Fish Restaurant, Amusement park, Green Theatre, Casino, Rollerdrome, Mini Golf, and Arcade building. The game integrates In-App Purchases and an in-game currency (which players also earn as they progress in the game): city credits and invest points. While anyone can complete the game without any In-App Purchases, additional in-game currency provides benefits like unlocked content and more energy to build the city. Share the city building joy with your friends – posting a Facebook achievement in Virtual City Playground is rewarded by in-game currency (limited to 1 invest point per day). Game Center is integrated for high scores and achievements. G5 Entertainment will be providing regular free updates to the game, offering players more content, game mechanics and enhancing social integration as well! Play sandbox mode for FREE! Over 90 new buildings, landmarks, and decorations, including Eiffel Tower, Statue of Liberty, Coliseum, Sydney Opera, and many more! Regular FREE updates that will bring more content! Minimized games continue transporting goods – making you money, even while you sleep! Entries (RSS) | Comments (RSS) | 91 queries in 0.588 seconds.